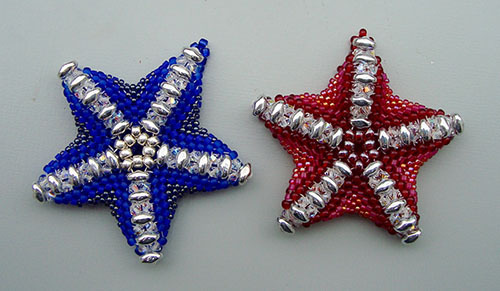 When ordering this pattern, please state that you want the Sparkly Peyote Starfish, as I have another starfish pattern. ​I need to know which pattern you prefer. A double sided and sparkly starfish. Wear one as a pendant, or string three together to make a necklace. A starfish can also be worn as a brooch/pin, or hung on a Christmas tree. Beginner/Intermediated level - this is an easy pattern. It works up quickly, and is a pleasure to make. ​The instructions are clear and detailed, with lots of diagrams & text. Beads used: 8/0 seed beads, Swarovski 2.5mm bicones, Superduos, 10/0 seed beads, 11/0 delica beads and 15/0 seed beads. About 5cm wide - point to point. 15/0: Use either Toho or Miyuki.